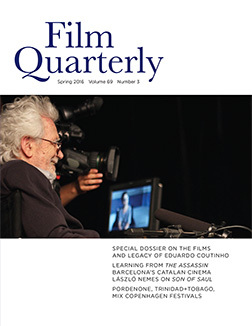 “FQ” the Film Quarterly podcast presents REFLECTIONS ON FILM IN 2017. 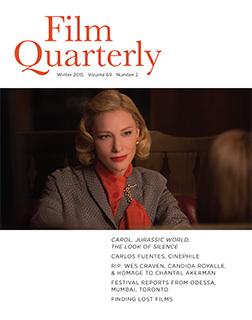 Bilal Qureshi, columnist of “Elsewhere,” and B. Ruby Rich, Editor, Film Quarterly, wrap up the year by discussing some highlights. It is a step outside of listmania– have a listen and share! 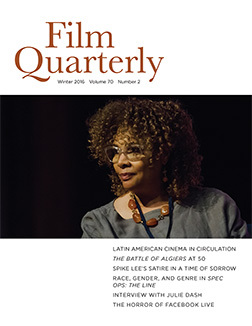 Editor B. Ruby Rich weighs in on the latest issue of FQ, new revivals in a time of duress, trends in distribution, FQ’s approach to watching, writing, thinking about cinema and media in a time of ongoing political repression, and more. 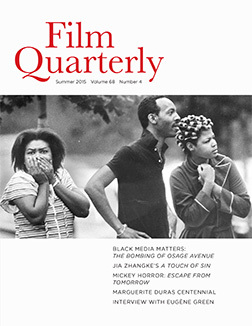 FQ Editor-in-Chief B. Ruby Rich’s survey of the Winter 2016 issue. 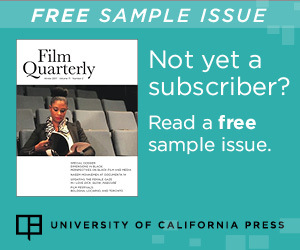 Her roadmap for navigating the ideas, authors, films, TV shows, and interviews featured within; a reflection on the state of film and media criticism, the beginning of awards season, and special tributes to Vertamae Smart-Grosvenor and Curtis Hanson. 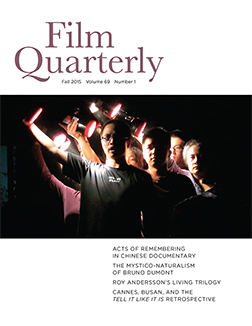 FQ Editor-in-Chief B. Ruby Rich’s quarterly roundup of the issue: Fall 2016, Volume 70, Number 1. 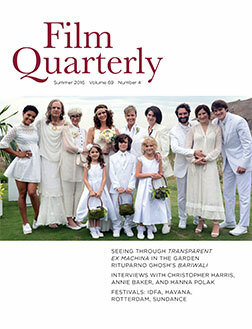 The issue pays homage to Chantal Akerman with a special dossier co-edited with Ivone Margulies. Rich also weighs in on being female onscreen and online, and the origins of Girlpower. 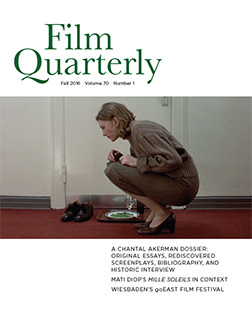 She charts a course for readers through this special issue that also includes the first English translations of some of Akerman’s work, Laura Mulvey on the Jeanne Dielman universe, an in-depth feature article on Mati Diop’s documentary MILLE SOLEILS, columns by Paul Julian Smith and Amelie Hastie, festival coverage, and more. I remember when. Today, conversations that recall an era when there were only a handful of broadcast channels, no internet, and only a few repertory houses for relief do really sound like dad or grandpa reminiscing about World War II or Vietnam: a nod to a time that seems at once tedious and unimaginable.